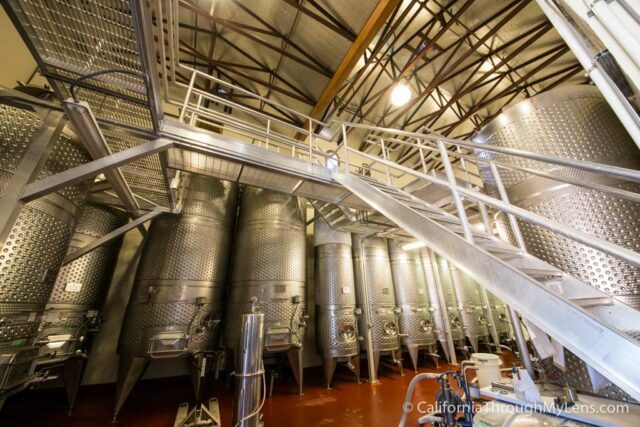 Call to get a winery tour in advance! Dario Sattui, the winery owner, owns two wineries and is from a fourth generation wine family that went out of business during prohibition. 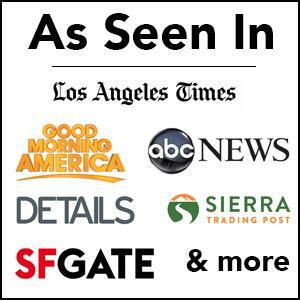 He decided to bring back the family business and bought the property when there was only 16 wineries in Napa. 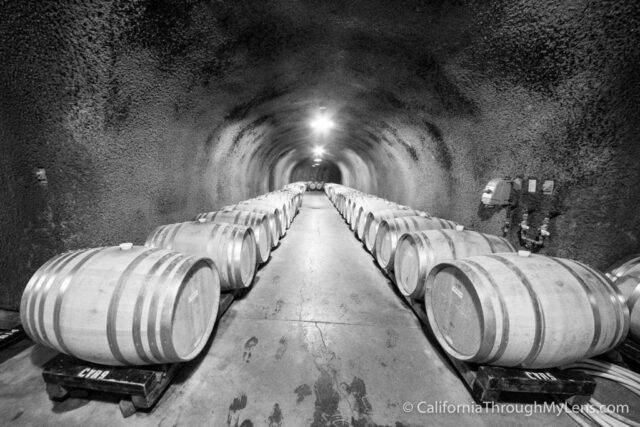 In 1993 he started working on the property by planting 30 acres of grapes and building caves into the mountain. He then got the idea of making a 13th century Tuscany style castle. 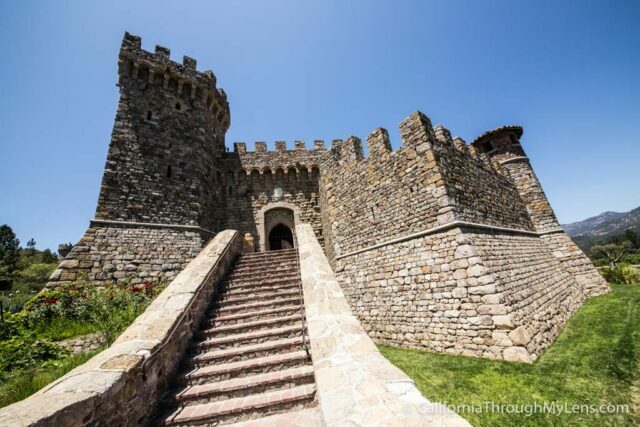 The castle is 121,000 square feet and took 15 years to build, it was opened in 2008. 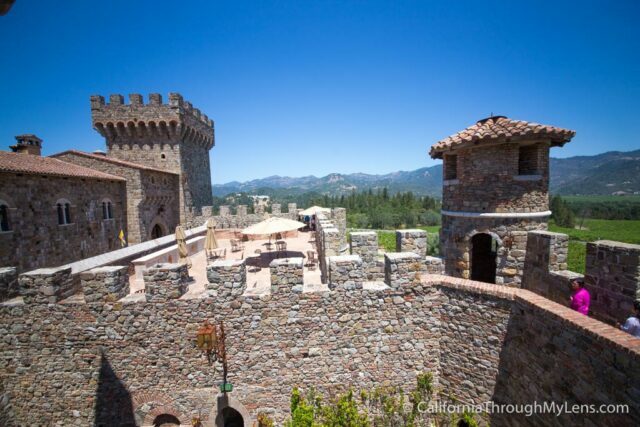 The castle has 107 rooms and 95 are dedicated to wine, 4 levels above and 4 levels below. 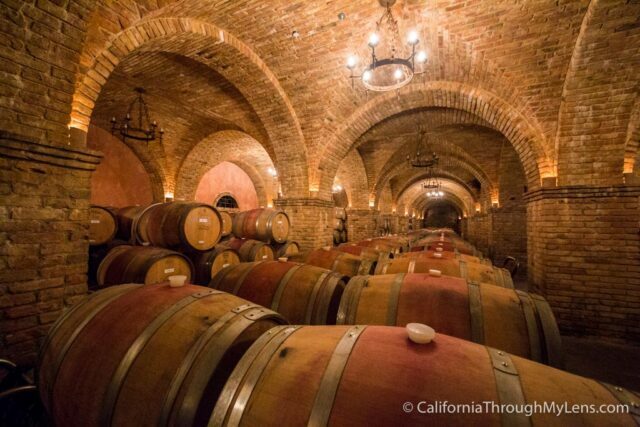 Wine flows through the walls in the castle as it is gravity fed from the tanks down to the barrels below. 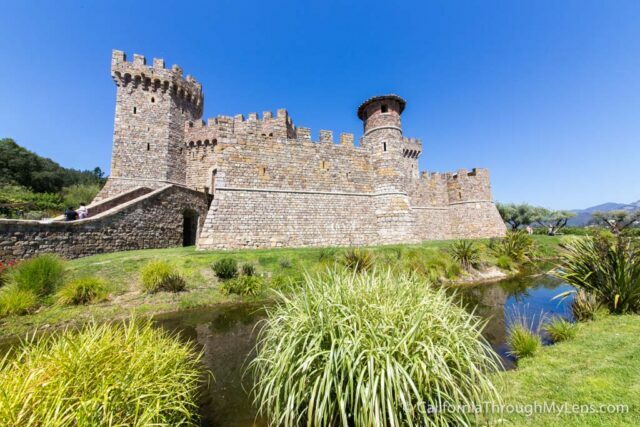 After booking my tour, I arrived 15 minutes early and walked around the property taking photos of the beautiful castle. 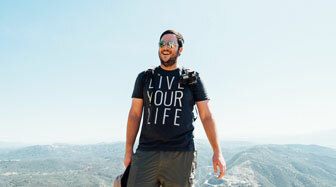 It is a popular destination, and even on a weekdays there are always lots of people exploring the area. I have been told that on the weekend this spot is crazy and can see 1,000s of tourists in a day, which is why it is important to book a tour in advance. I got on a tour with the fabulous Kerry and we started exploring the castle. 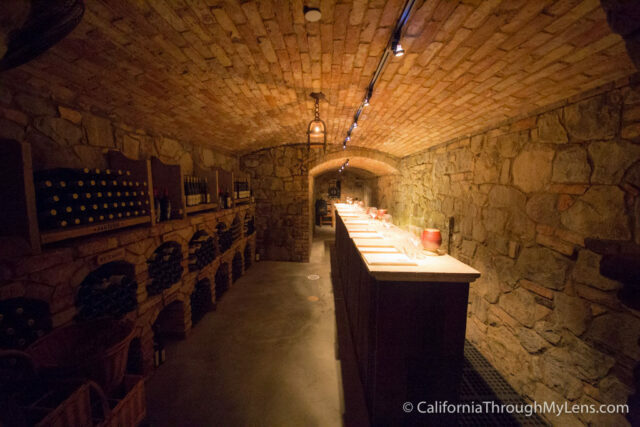 Here are some of the things you see, but I recommend going on the tour yourself, $35 seemed like a good value for what you got to see and the wine / grape juice you can taste. This is the first spot that you see when you enter the castle and this is where the history of the castle was told to us. 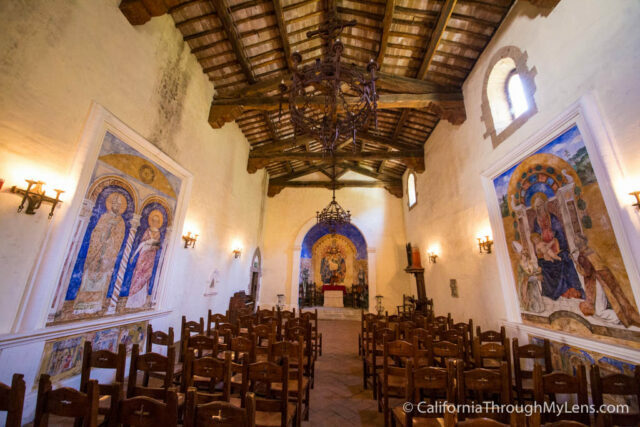 They used to hold mass in this room on Sunday mornings, until Napa started requiring a permit and they stopped. 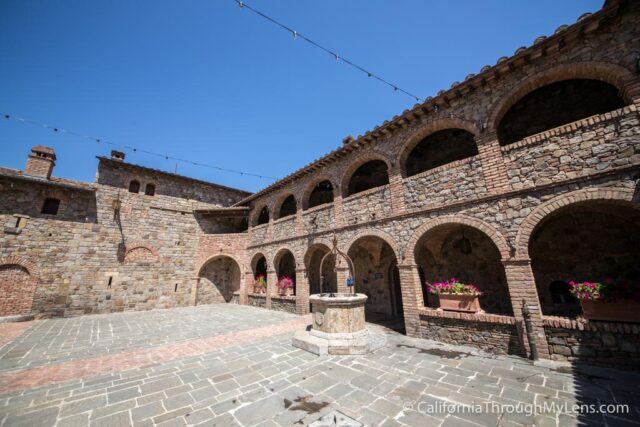 The courtyard is the next stop and it is a beautiful area designed to look like how it would have in the time period of the castle. 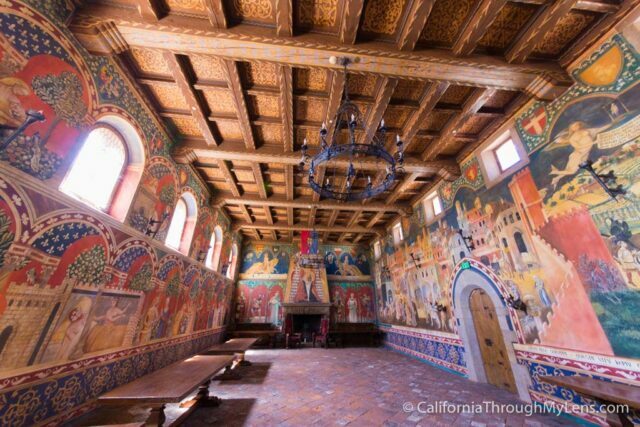 It even has an upper room that nobility would have stayed in and is used for concerts and other things. 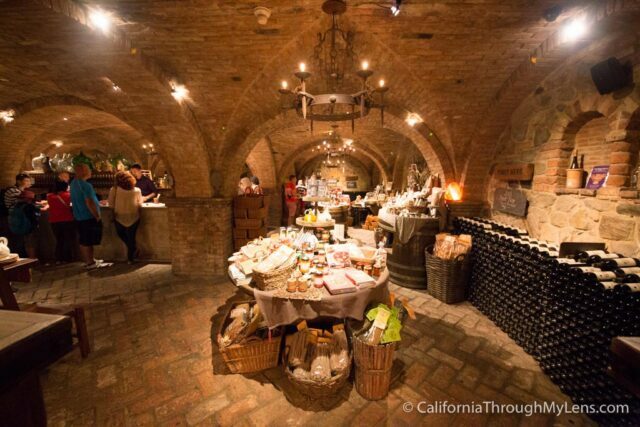 This was one of my favorite rooms in the castle and it is available to see without the tour. It reminded me a lot of the different castles I have toured in Europe and was meticulously painted to have each wall covered in art from the time period. Next we headed into the fermentation area which featured massive stainless steel tanks. All the tanks are hand punched and imported from Italy which makes them some of the most expensive tanks you can buy. Our guide was really knowledgeable about the process and it was fascinating to learn about, especially about how the wine feeds through the walls. From there we headed down into some of the lower levels of the castle. I can honestly say that it must take a month to learn the layout as it is so incredibly massive and it would be very easy to get lost. 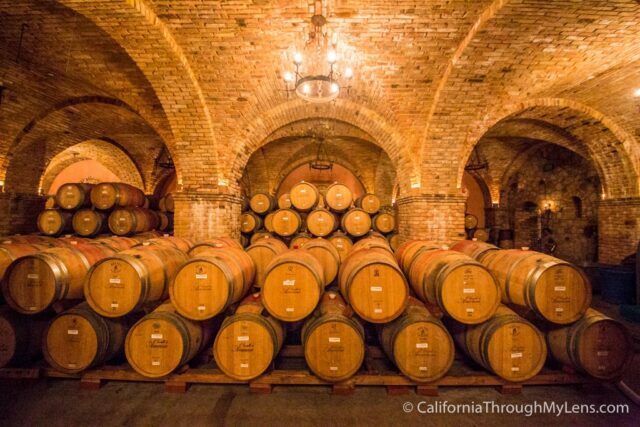 As you are wondering through the underbelly of the castle you will be constantly flanked by wine barrels in every empty spot they have. 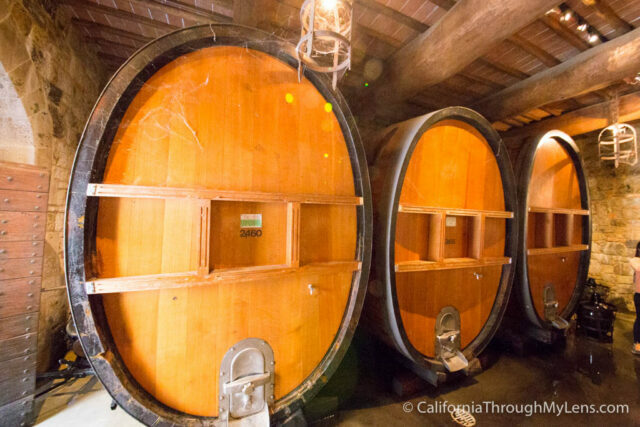 The barrels are from trees at least 150 years old, imported from France and are only used once or twice before they are sold. 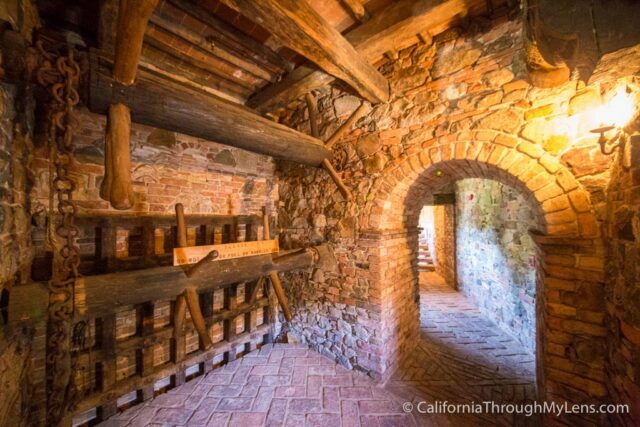 They even had a few rooms where the entire walls are built of the bottled wine from the years before they started releasing. 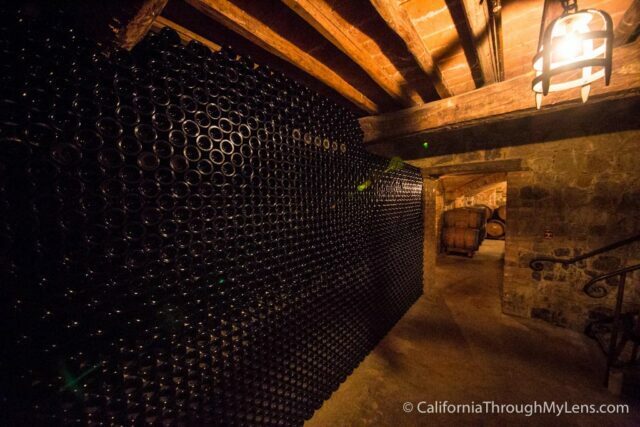 It is said that the owner and the workers tried the wine and since it wasn’t the best that it could be, they just lined the walls with the bottles and didn’t let anyone else try it. 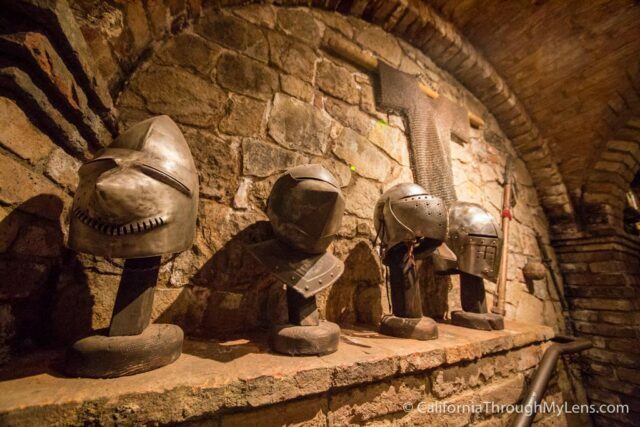 This room has a lot of old medieval pieces of armor that were either made for the castle or imported from Europe. They even had a pit of despair as well which would mimic those that were found in these types of castles. 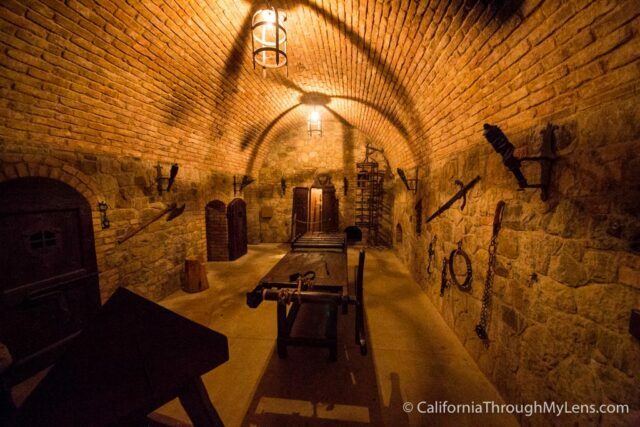 This dimly lit rooms features a bunch of different grotesque torture devices from back in the day. It is a variable museum of these types of contraptions and even I was shocked by what a few of them did, be warned if you bring children. All of them are replicas other than the big one with spikes at the end which is authentic. From there you head into the great room, which took over 2 years to build just itself. This room is so beautiful with high arching ceilings and rustic brick. In here the guide let us try wine directly from the barrel, which is not something that you are often able to do. After this we headed to one of the private wine tasting rooms where you can try up to 5 different wines or the grape juice that they make here as well if you do not like wine. It was a good end to the tour and a fantastic way to think about how crazy of an adventure you just had in a winery. 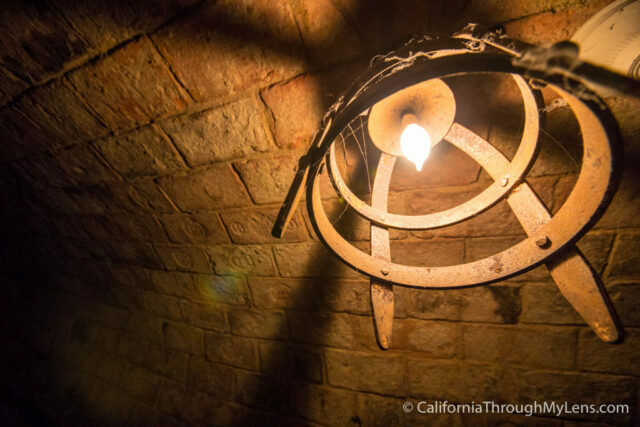 After that you are free to leave the castle or continue to explore some of the upper rooms. 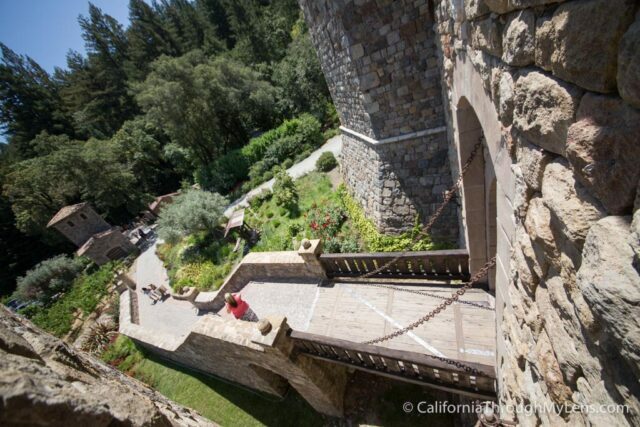 I would recommend that you head up the castle tower near the entrance as it features a beautiful view of the top of the castle. It also has a working door wheel that could be used to raise and lower the doors. This is a great way to end your time at the castle and you can just sit up here and take in the views as well. All in all, this is a fantastic spot, one that I couldn’t recommend more. 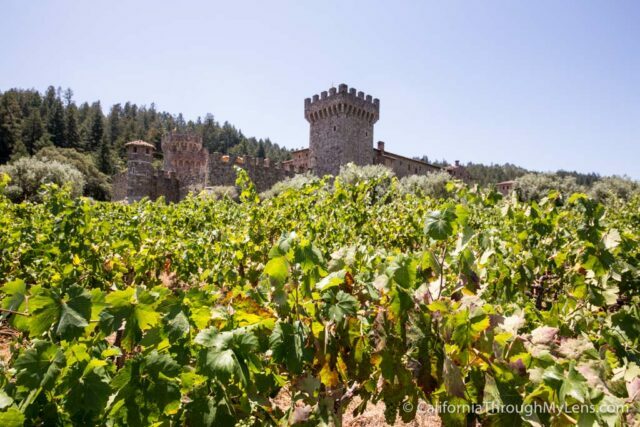 Sure $35 is expensive, but when you compare that with the fact that most other wineries are at least the same amount for tasting in Napa and don’t include a castle to explore, it seems like a good price for such a unique spot. I would love to hear what you think in the comments below.